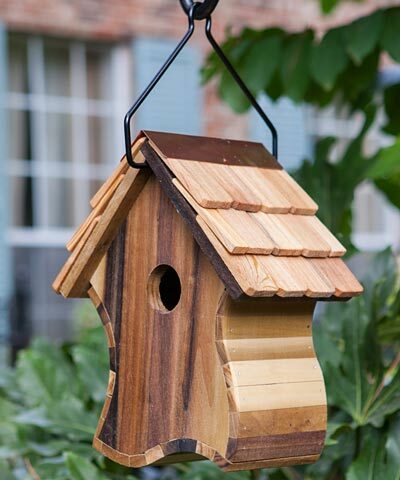 Add delightful shape to your backyard with this Heartwood Swirlie Bird Bird House. Concave sides and a curving base contrast the pitched roof of this shelter, bringing a striking bit of geometry to your garden with ease. Varied brown hues of the poplar construction lend drama to the home, completed by wooden shingles and copper flashing on the roof. A 1.5" diameter entry hole on the front of the abode allows birds to enter and use it, while drainage on the base helps the nest remain dry. Ventilation gaps prevent nestlings from overheating, and a black, powder coated hanger makes it easy to suspend the home from a branch or bracket. The unique, poplar slats connect to form the striking curves of this piece, and offer birds a wonderful roost for many seasons. The brown tones showcase the beauty of nature, and the item is meticulously crafted for durability. Turn heads and offer birds shelter in your garden by adding this Swirlie Bird Bird House to it. Made in the USA.